Description: This shrub is 3-9' tall, sending up multiple woody stems from the base. These woody stems are often recurved and frequently divide into smaller stems. The bark of the lower stems is dark brown to dull orange, eventually shredding into thin strips or broad sheets. Young stems are light green to slightly reddish and hairless. The alternate leaves are up to 5" long and 4" across; they are oval to ovate in overall shape, but often divided into 3-5 shallow lobes. 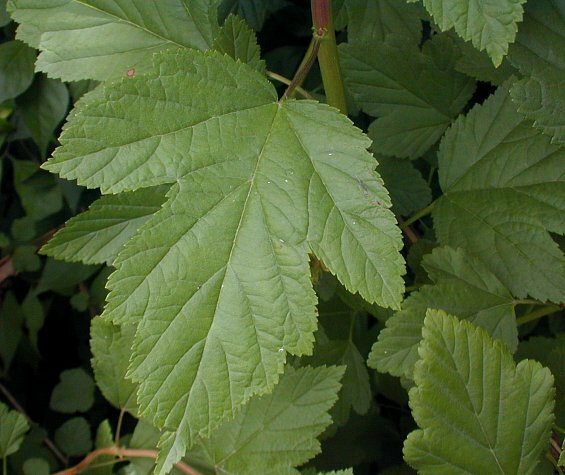 The leaf margins are coarsely crenate-dentate. The base of each leaf is slightly cordate, truncate, or rounded. The upper leaf surface is medium to dark green, while the lower leaf surface is light green; both surfaces are hairless (occasionally the lower surface may have a few sparse hairs). At the base of each leaf is a slender hairless petiole about ½–1" long; it is light green to slightly reddish. At the base of each petiole, there is a pair of small linear stipules. Young stems often terminate in round clusters of flowers about 2-3" across. Each of these flowers spans up to ½" across; it has 5 white petals, a light green calyx with 5 teeth, 5 styles, and 30-40 exserted stamens. The pedicels of the flowers are rather long, light green, and slender. The blooming period occurs from late spring to early summer and lasts about 2-3 weeks. Later in the summer, the flower clusters are replaced by drooping greenish-red fruits (typically 2-5 adjacent fruits per flower). Each fruit is about 1/3" (8 mm.) in length and angular-ovoid in shape with a slender beak originating from one side. The fruit surface is inflated and membranous; var. opulifolius has a glabrous surface, while var. intermedius has a hairy surface. The interior of each fruit is seedy and dry. This shrub reproduces by reseeding itself. Cultivation: Favorable growing conditions include full to partial sunlight, moist to dry locations, and loamy, sandy, or rocky soil. 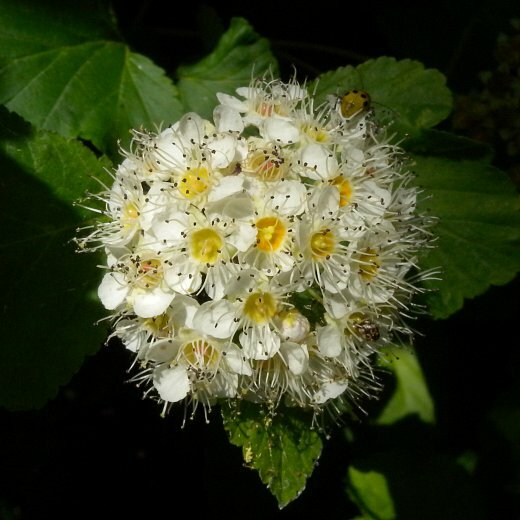 Generally, Ninebark is easy to cultivate and will adapt to a variety of environmental conditions. The ultimate size of this shrub depends on soil fertility, moisture levels, and maturity. Range & Habitat: The native Ninebark is occasional in the northern half of Illinois, and rare in the southern half of the state (see Distribution Map). Habitats include bluffs, thinly wooded hillsides, cliffs, rocky banks of streams, sandy seeps, thickets, and hedge rows. This shrub is used occasionally as an ornamental plant in gardens and yards. Faunal Associations: The flowers provide nectar and pollen to a wide range of visiting insects, including bees, wasps, flies, and butterflies. 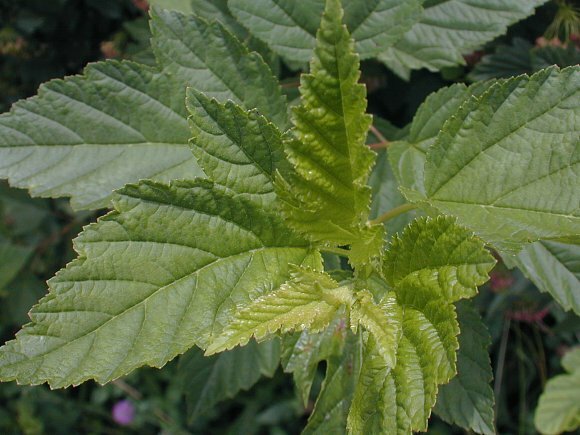 Some insects are known to feed on various parts of Ninebark. Such insects include aphids (Aphis neilliae, Utamphorophora humboldti), stem-boring larvae of the beetle Dicerca pugionata (Witch Hazel Borer), Calligrapha spiraeae (Spiraea Leaf Beetle), the plant bug Plagiognathus punctatipes, and caterpillars of the moths Eulithis molliculata (Dimorphic Eulithis), Nepticula opulifoliella (Ninebark Pigmy Moth), and Olethreutes permundana (Raspberry Leafroller); these insects are oligophagous (prefer to feed on Ninebark and similar shrubby species). Polyphagous insects that feed on Ninebark include caterpillars of the moths Lomographa vestaliata (White Spring Moth), Palthis angulalis (Dark-Spotted Palthis), and Schizura unicornis (Unicorn Caterpillar). For more information on these insect species, see MacRae (1991), Hottes & Frison (1931), Pepper (1965), Wheeler et al. (1983), Covell (1984/2005), Wagner (2005), Miller (1987), and Forbes (1923). White-Tailed Deer probably browse on the foliage and branches of this shrub, and some upland gamebirds may eat the seeds. Photographic Location: A hedge row between a yard and a railroad in Champaign, Illinois, and the Lincoln Garden at Springfield, Illinois. Comments: Ninebark is closely related to the better-known Spiraea spp. (Spiraea species) as they have similar fruits. Unlike many other shrubs in the Rose family, these fruits are non-fleshy and inedible to humans. 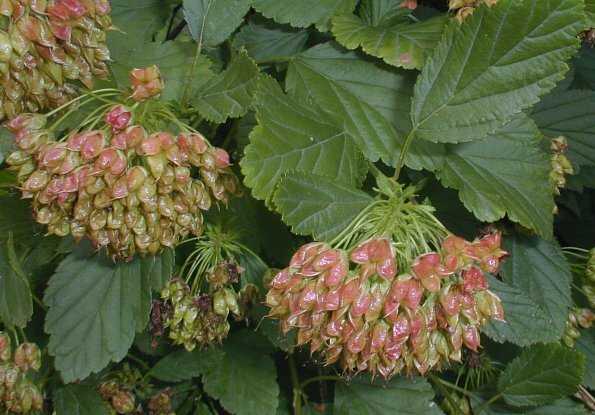 Ninebark can be recognized by its lobed leaves, peculiar shredded bark, and drooping clusters of inflated fruits. The flowers are quite attractive during the relatively short period when they are in bloom. This is the only Physocarpus sp. in Illinois, although there are other species in this small genus in some of the western states.